In general, DNA detection involves the following four steps: DNA extraction, DNA amplification, electrophoresis, and gel image analysis. Each step requires expensive equipment. Generally, a gel documentation system is widely used as a DNA detector. For the analysis of gel images, the most expensive imaging systems are used. Therefore, various studies are under way to create a gel documentation system of small size and low cost. In recent years, the rapidly developing open platform has been applied to various embedded systems. The open platform provides connectivity from a local area network to a global area network, making it easy to build various systems embedded into an Internet-of-Things (IoT) system. In other words, using the open platform makes it easier to develop an embedded system that can be accessed anytime and anywhere. In this paper, we propose a gel documentation system and compare its performance with that of the existing system, because the high-quality smartphone camera is being continuously developed for the open platform. Experimental results show that the proposed system has performance characteristics similar to those of the existing system while showing superiority in terms of price, size, and user convenience. 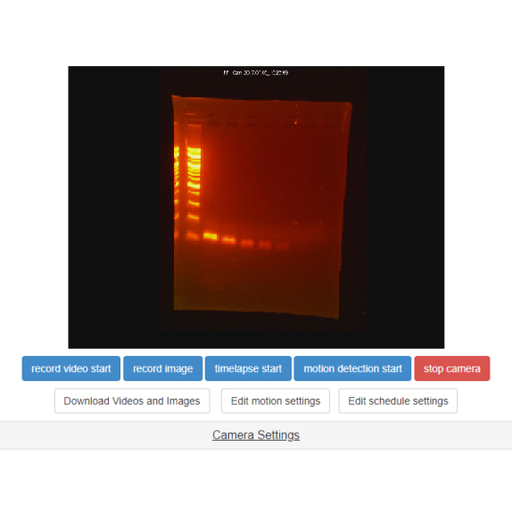 Deuk-Ju Lee, Yeo-Reum Kim, Jong-Dae Kim, Yu-Seop Kim, Hye-Jeong Song, and Chan-Young Park, Gel Documentation System Using an Open Platform Camera, Sens. Mater., Vol. 31, No. 2, 2019, p. 287-292.